Luke Langholz Pottery: Glazing, and a drawing for you. This here's a drawing, on account of how I haven't done anything in the studio warranting (the time required in) any photography. 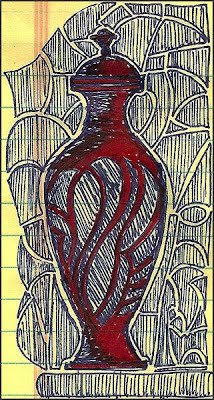 And by drawing, I really mean a doodle from one of my notepads at work. But there it is - some visual addition to my Tuesday's Text. I did get to spend some time in the studio this weekend, but I soon realized that the amount of bisqueware I have sitting around has gotten out of hand and the only reasonable way to deal with all the bisque is by doing some glazing, which is never my preferred task, but had to be done. Lots of little, baby, white vases that needed glazing. I'm experimenting with using some vibrant colors on these little vases. I hope it turns out alright, but you never really know. Back to the studio tonight - I have some bowls in desparate need of some trimming, and should really do some more throwing as well. On the docket for this week is taking stock of my inventory, so I can figure out what needs to get thrown between now and the upcoming shows. That's all for now - maybe a pottery update tomorrow. UPDATE - so, apparently I only saved, rather than actually posting this after it was written (48 hours ago). I did get to the studio for a bit Tuesday night, and did get some pictures, but it was mostly trimming and decorating. Little bits of throwing, including a nice vase that tipped over as I was prepping to wrap it up for the night. So that didn't work out too well... That's it for studio this week - maybe I'll get the pictures up tomorrow in Friday wrap-up.